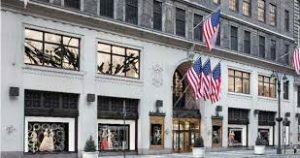 Our readers may have seen the recent report in The New York Times pertaining to the sale of Lord & Taylor’s flagship location in Manhattan to a co-working space company called WeWork. This seismic change in the use of “America’s Dress Address” is quite significant. Lord & Taylor realized that its huge location in Manhattan was out of fashion and much more valuable when considered as a real estate asset only, rather than the proceeds generated by mostly clothing sales. WeWork is a company most identifiable with the revolutionary means in which millennials are choosing to work. Many millennials tend to be self-employed, but may prefer to work away from home. They demand temporary and flexible work quarters. WeWork allows such people to select a location for the short or long term at a price to be determined, without a long term commitment. The worker or user has a professional location in which to engage in his occupation. This post will address this transaction from a commercial leasing perspective. The purchaser will use the Lord & Taylor property as its headquarters, through which it will presumably enter other commercial leasing transactions for other properties, and for shared work quarters in this property. When entering commercial lease transactions for other properties, this author would suggest attempting to obtain the following provisions in such commercial leases. Commercial leases typically identify the permitted use, such as real estate office, medical office and the like. However, in this case, the tenant will want the use to be as broad as possible. For instance, general office use, including co-working space and ancillary use may be suitable for this tenant. That way, when multiple parties occupy and leave the premises and use the space for varied purposes, it will not be a lease violation. Co-working spaces could be shared by diverse parties such as writers, day traders, salesmen as well as those who want to host conferences and meetings and the like. The tenant needs to insure that lobby services and flexible security access is provided by the landlord. That way, newcomers and visitors to the space will be welcomed to the leased space. Further, 24/7 building-wide services are essential for a co-working space tenant. The tenant cannot be certain who will ultimately be using the space, but if someone wants to work on weekends only, comfortable temperatures and building access is essential. The landlord should be prohibited from charging more for the use of the HVAC system and elevator outside of traditional working hours. In addition, the use of passenger and freight elevators cannot be limited at any time, so that the millennial office workers have unfettered access and can even bring their bicycle upstairs to the office, as is desirable to many. Uninterrupted HVAC, electricity, water and elevator services are essential to this tenant or a rent abatement should be negotiated in the lease. In suburban locations, parking rights are significant. A large number of parking spaces needs to be accessible to the tenant because one user may host fifty people while another may need only two parking spaces. The tenant needs to avoid a landlord’s tendency to be stingy in allotting parking spaces. Building renovations and construction are detrimental to an office sharing tenant. The users may seek other locations, so as not to live through renovation and construction. These users by definition can always work somewhere else, so they are always going to select the most desirable location. The attorney representing the tenant should try to negotiate a rent abatement during such construction period to account for the likely reduced occupancy of the space. This tenant needs the ability to lease or license to individual users without the landlord’s consent, because this business model is dependent upon the constant change in users of the space. If the landlord’s consent were required in every instance, the tenant could not effectively operate. In a similar fashion, the office sharing tenant requires broad flexibility with respect to cosmetic upgrades and ability to move partitions without the landlord’s permission. It can be easily anticipated that there will be a constantly changing layout. One user may want closure, partitions and ceiling surrounding her, so that she can write in a quiet surrounding. Another person may need to host meetings of twenty people and requires a conference room setup. Our attorneys consider the modern up-to-date use of properties and negotiate leases from that perspective on behalf of their clients.